Players are in a group of 3 or 4. Ball begins on side with 2 players. Squares are set up so we can progress to 3 v 1 after. Player passes across to other player and runs as a passive defender (as realisitic as possible) towards their pass and the receiver performs a move then passes to the next player in line and the same sequence occurs again. In the picture, the player is performing a V. The defender needs to close down the attacker quickly since the moves are used in high pressure situations. 1. Timing of when to do move. Distance and which side to do move on (based on defender approach). 2. Selling moves with hips (when appropriate). Grid is 10 x 10 (or bigger if needed). Players try to keep possession against defender (3 v 1). For advanced players, we will reduce the amount of touches they have. Defender must regain possession before they can come out (i.e. cannot just kick ball, must have possession). Player who made error goes in middle. 5. When player is too obvious in a playing option (e.g. as ball is coming they open up their body to where they are passing), to use that option as a fake. Groups of 4 or 5 in a 10 x 10 grid (grid size adjusted based on needs). Players are set up like in a 4 v 2 or 5 v 2 monkey in the middle game BUT there are no defenders. As per top left of picture. The focus is on constant movement and support habits. Even the far support should be in a habit of creating an angle for the pass. 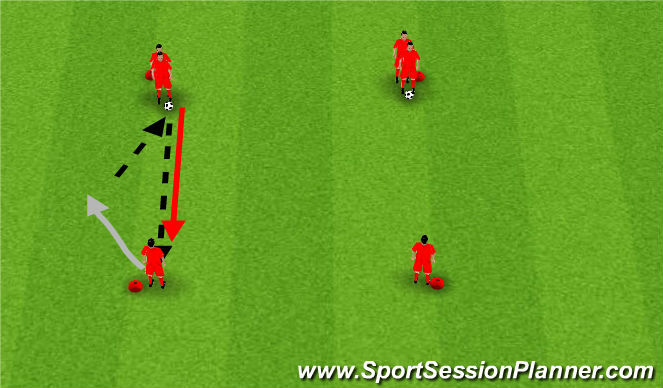 Players will use anywhere from 1-3 touches to move the ball around at a HIGH tempo. 40-45 second rounds (2-4 rounds). 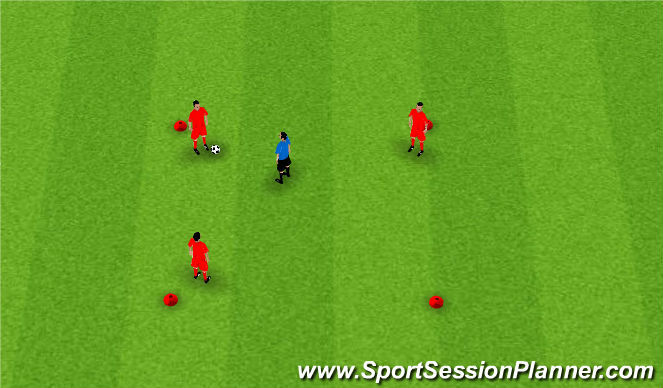 Players are encouraged to mix it up: fakes, one touch passing, two touch passing. Rest can range from length of round or longer. An incentive for high intensity, everytime the movement isn&apos;t of maximum effort (e.g. support players don&apos;t move to support) a point is recorded which translates to burpees. 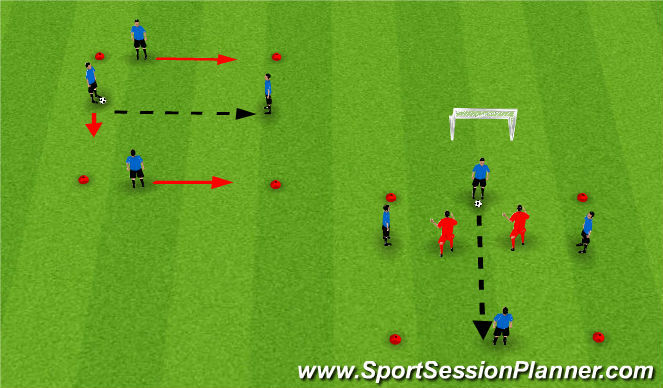 Combine groups to make 4 v 2 or 5 v 2. Rotation in middle defenders. In bottom right of picture. Restrict touches as needed (3 touch, 2 touch). Player who passes and receiver go in. Defenders have to regain possession. If group makes 5 passes (coach decides) then middle players have to stay in for another round (i.e. have to win the ball twice). 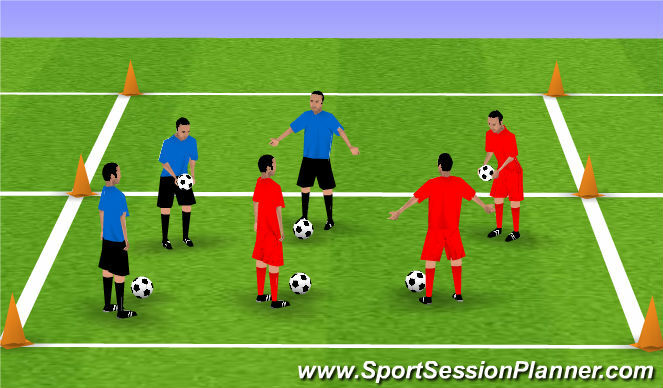 Players are in teams of 2 (three teams of 2), two teams work together to make a 4 v 2. If a player makes error then teammate goes in middle as well. After a set number of passes (e.g. 5), the teams on outside are trying score on goal to get a point.